Height: Ideal height for a male is 14 1/2 inches (37 cm) at the withers. Females are generally about one inch smaller. Weight: Males weigh approximately 17 lbs (7.5 kg). Males are squarely built and females may be slightly longer in length. Breeder with puppies available occasionally. The Lakeland Terrier, once known as the Patterdale Terrier, originated in Cumberland County in England in the early 19th century. The Lakeland was bred to hunt vermin in the rugged shale mountains of the northern England Lake District. 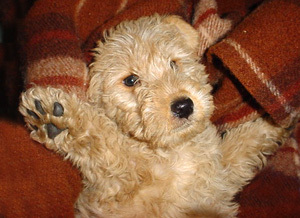 Some of the breeds involved in the development of the Lakeland Terrier include: The Wire Fox Terrier, the Border Terrier, the Bedlington Terrier, and the early Dandie Dinmont Terrier. 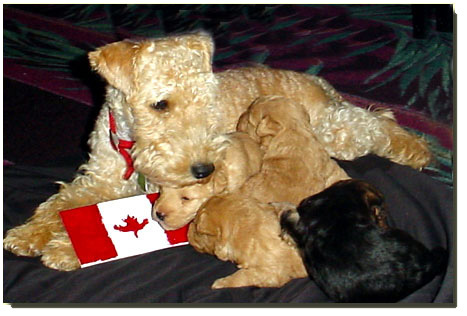 The Lakeland has the typical Terrier temperament, that being bold, friendly, happy and self-confident. He makes a good watchdog and a great companion. He is typically alert, loves activity and is always ready to go. At times, he is also very intense and determined. Shyness and over aggressiveness is not typical of the breed. He has a short, hard and wiry outer coat with a soft undercoat. He comes in a variety of colours, including blue, black, liver, black and tan, blue and tan, red, red grizzle, grizzle and tan, or wheaten.